For bookings through December 10th, 2018 SAS is offering an amazing promotion. From Boston, Chicago, Los Angeles, Miami, New York (Newark), San Francisco or Washington DC you can buy just one adult ticket in economy or premium economy and the kids fly “free”. Free is in quotation marks because you simply pay taxes and fees, which are about $60 per child round trip. Up to 8 children may travel with a single adult ticket for “free”. Sadly, no matter how poorly behaved any adults in your family may be, children are defined as ages 11 and under, with no exceptions. You can travel between January 8th and April 2nd of 2019. All SAS “Go” economy fares include meals, drinks and entertainment. With the exception of “Go Light” all fares also include one checked bag. 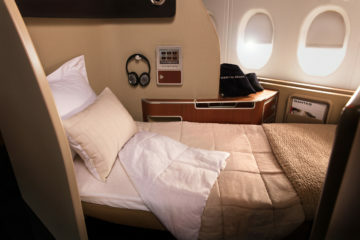 SAS Plus is the airline’s premium economy, which offers considerably more legroom, pitch and amenity, like a second free checked bag and airport fast track access where available. The kids fly “free” promo applies to either cabin, so if you can find a great premium economy deal, it could be worth aiming for that, if at all possible. This kind of SK deal can be booked via travel agencies too without using the SAS website. At least in prior seasons. This can be a great way for people with a big family to get MS * Gold status. Or to rack up points in programs with family accounts. Great comment! Thanks for the valuable contribution. I’m sure many people will wish to do this, or via their credit card points through Chase, etc. This is why the comments section is still here! WE just returned from a 3 week trip with our five children. We used the SAS tickets to get to europe and then flew to Barcelona and took a cruise from there. MSC has a lot of deals where children cruise free, as well.